A new study found that complications were down in women who had an epidural, spinal block or a combination of both forms of anesthesia as part of their C-section. Good news if you have an epidural or spinal block during a C-section: They could be safer than ever. Indeed, over the past 10 years, complications from those procedures went down 25 percent. The rate of overall complications in women who had those forms of anesthesia fell from 8.9 per 1,000 women in 2003 down to 6.6 per 1,000 in 2012, according to the report published in Anesthesiology. Cynthia A. Wong, M.D., one of the researchers, says most women receive a neuroaxial anesthesia, such as an epidural or spinal block (or a combination of both) to relieve pain during a C-section. (An epidural provides continuous medication; a spinal block is a one-time shot. Sometimes physicians use a combination of both types of anesthesia.) 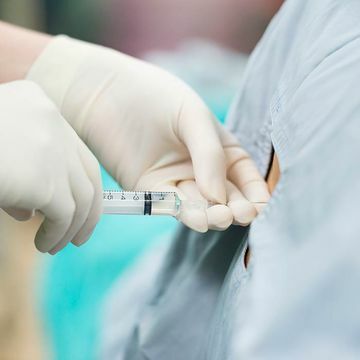 General anesthesia, which makes you unconscious during the procedure, is used in some emergency situations or in cases where mothers have certain types of infections. Though Dr. Wong's team did not assess what caused the decline in complications, she believes it can be attributed to better patient care. "We've improved our anesthesia techniques so it's safer for all women," she tells Fit Pregnancy. Wong says the better outcomes are likely because doctors have established and stuck to better surgical protocols, and improved medication dose accuracy as well as monitoring. "It's hard to tell [what caused the improvements], but it appears that things have gotten much better over the past decade," Dr. Wong adds. When they examined data from more than 785,000 C-sections in New York hospitals between 2003 and 2012, researchers found the number of C-sections went up from 28.7 percent in 2003 to 34.7 percent in 2009. It was stable from 2010 to 2012, consistent with national data. During the study period, more than 5,700 women had at least one anesthesia-related complication. Major events included stroke or aspiration, and minor events included headaches and pain during surgery. There was a 43 percent reduction in major events and a 23 percent decrease in minor events. Though C-sections under general anesthesia were down 21 percent during the study span, Dr. Wong's team did not find a decrease in the overall rate of complications in women who were given general anesthesia for the procedure. In general, the death rate following C-section dropped significantly, according to the report. As for the rate of complications not caused by anesthesia, that went up 47 percent—something the researchers say could be because more women having C-sections had pre-existing medical conditions.